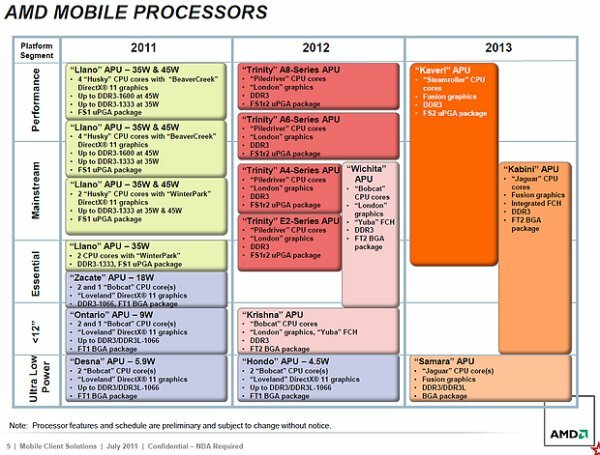 DailyTech published a writeup of all the details that were leaked about AMD's 2012 and 2013 Fusion roadmap, you can read it over here. It shows that AMD likely has already shipped engineering samples of its Llano refresh "Trinity". Trinity prospect launch date is January 2012. Its chips will be branded E2s, A4s, A6s, or A8s. It will come with a graphics refresh ("London"/Northern Islands) and will swap the "Husky" cores for "Piledriver" cores -- "enhanced" versions of AMD's new 32 nm Bulldozer architecture. Confusingly, Trinity's platform has yet two more code-name -- "Comal" for laptops and "Virgo" for desktops -- and the slides point to it being sold alongside Llano for Q1 2012, with Llano being phased out by Q2 2012. This may create some market confusion as both the new and the old chips will share the same A-Series branding.